When a person has cancer, some of the cells in his or her body have changed and are growing uncontrollably. Most cancer drugs try to treat the disease by killing those fast-growing cells, but another approach called immunotherapy tries to stimulate a person’s own immune system to attack the cancer itself. Now, scientists at the University of Washington have developed a strategy to slow tumor growth and prolong survival in mice with cancer by targeting and destroying a type of cell that dampens the body’s immune response to cancer. The researchers published their findings the week of Sept. 16 in the Proceedings of the National Academy of Sciences. “We’re really enthusiastic about these results because they suggest an alternative drug target that could be synergistic with current treatments,” said co-author Suzie Pun, a UW associate professor of bioengineering. Our immune system normally patrols for and eliminates abnormal cells. Macrophages are a type of helpful immune cell that can be converted to the “dark side” by signals they receive from a tumor. When inside a tumor, macrophages can switch from helping the immune system to suppressing the body’s immune response to cancer. Several studies show a correlation between the number of macrophages in tumor biopsies and poor prognosis for patients, Pun said. The UW team developed a method to target and eliminate the cancer-supporting macrophages in mouse tumors. Researchers predict this strategy could be used along with current treatments such as chemotherapy for cancer patients. “We think this would amplify cancer treatments and hopefully make them better,” Pun said. Scientists have a strong understanding of the behavior of macrophages in tumors, but most current methods to remove them do away with all macrophages in the body indiscriminately instead of targeting only the harmful ones that live in tumors. In this study, UW bioengineering doctoral student Maryelise Cieslewicz designed a method to find a specific amino-acid sequence – or a peptide – that binds only the harmful macrophages in tumors and ignores helpful ones in the bodies of mice. 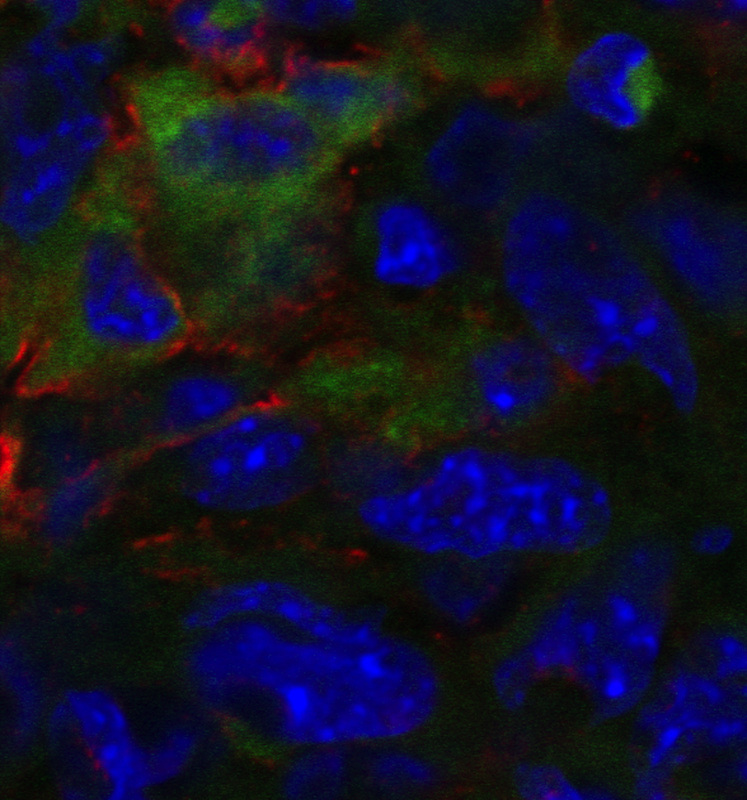 When this sequence was injected into mice with cancer, the research team found that the peptide collected in the macrophage cells within tumors, leaving alone other healthy organs. Once they discovered they could deliver the peptide sequence to specific cells, the researchers attached another peptide to successfully kill the harmful macrophages without affecting other cells. The mice had slower tumor growth and better survival when treated with this material. The research team plans to test this method with existing cancer drugs to hopefully boost the success of other treatments. The peptide sequence that successfully bound to harmful macrophages in mice doesn’t bind to their counterparts in humans, Pun said, but the researchers expect soon to find a similar peptide that targets human cells. They plan to use this method to investigate treatments for other types of cancer, including breast and pancreatic cancers. The Pun research team collaborated with the UW labs of Elaine Raines in pathology and André Lieber in medical genetics on this study. The research was funded by the National Institutes of Health and a National Science Foundation fellowship. For more information, contact Pun at spun@uw.edu or 206-685-3488.